I once read a quote that said, “Jackie Robinson loved baseball more than baseball loved him.” Jack Roosevelt Robinson, son of a sharecropper, raised in a small Georgia town, was the first African American to play in the big leagues. Jackie Robinson, a graceful, and dignified man leveled the playing field during a time when most were not graceful, or respectful towards him. On April 15, 2016, Major League Baseball will once again honor Robinson at stadiums throughout the country. The players will wear his #42 jersey, fans will applaud at the mere mention of his name, and Danny Bakewell Sr., Executive Publisher of the Los Angeles Sentinel and the L.A. Watts Times, Chairman of the Brother­hood Crusade and Chairman of The Bakewell Company will have the honor of throwing out the first pitch at Dodger stadium. A fitting honor for Bakewell (bestowed upon him by Jackie Robinson Day sponsor, Bank of America) whom many would say has sought to also level the playing field. Described as a ferocious and fearless community activist, Bake­well has dedicated his life to being a voice for the voiceless. On April 15, 1947, Danny J. Bakewell, Sr., was just a baby when Robinson, 28, took the field as a member of the Brooklyn Dodgers at Ebbets Field. It is well documented that Robinson encountered ugly, vile acts of racism from fans, the opposing team, and yes, even some of his own teammates. 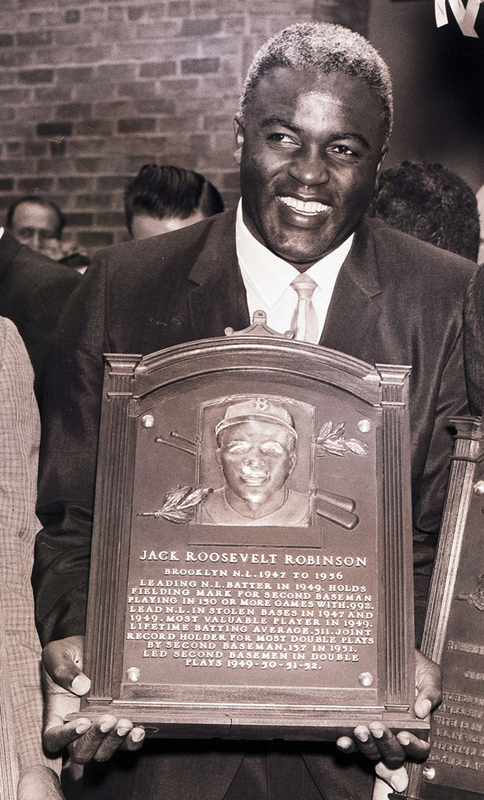 Despite the moronic and intolerant behavior of many, Robinson would go on to win the first-ever Rookie of the Year title, become the National League’s Most Valuable Player, the Dodgers’ highest paid player and help lead the Dodgers to win the 1955 World Series. Jackie Robinson would be the first African American inducted into the Baseball Hall of Fame and to have his number retired by Major League Base­ball. Martin Luther King Jr., said that Robinson “had a dramatic impact on the civil rights movement, because he forced people to confront the possibility of change.” And change is a word synonymous with the present-day work of Danny J. Bakewell Sr, a man who embodies the spirit and determination of Jackie Robin­son. 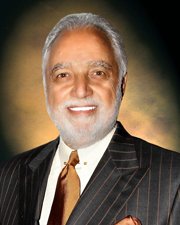 It was Danny J. Bakewell, Sr. who built and led the Brotherhood Crusade, an organization committed to civil rights and community development to raise over $60 million for community initiatives. It was Bakewell that purchased the Los Angeles Sentinel, the oldest and largest Black-owned weekly newspaper west of the Mississippi and later purchased the L.A. Watts Times expanding his leadership and ensuring that stories important to people of color were published. He promised that he would champion not just his newspapers but also the Black Press across the country. Bakewell is honored to serve as Chairman Emeritus of the NNPA (National Newspapers Publishers Associa­tion), with a membership of 200 black newspapers around the country. “Our responsibility is not just printing our newspapers. Our responsibility is making life better for our people,” Bakewell said. It was Danny J. Bakewell, Sr. who created The Taste of Soul of Los Angeles in 2005, which has become one of the most popular and best attended family festivals in all of Southern California with 350,000 attendees from around the south­land and across the country. Bakewell said he created the Taste of Soul “to encourage the enjoyment, respect and appreciation of our community and each other in an atmosphere of respect, peace, pride and pleasure.” Taste of Soul has become an economic engine boost for businesses to sell and promote their wares and talents. Bakewell, the family man, along with his wife Aline, founded Sabriya’s Castle of Fun Foundation for hospitalized children, in memory of their daughter, Sabriya, who lost her life to leukemia. He also founded the African American Unity Center, Brotherhood Business De­vel­opment and Capital Fund and was a trailblazer for many efforts in the civil rights movement in Los Angeles. Bakewell and Robinson shared familial roots in the City of Pasa­dena. Robinson was raised in Pasadena, CA and Bakewell raised his family there. His children Danny Jr., Brandi and Sabriya attended school. Like Robinson, Bakewell broke many barriers in the civil rights movement to foster equality for African Americans. Bakewell is known for leading the efforts to integrate the Pasadena Tournament of Roses Board of Directors. Because of his leadership, the Tournament of Roses inducted its first woman and first African American to the board in the 1980s. It is not surprising that Bank of America, when given the opportunity to suggest someone to throw out the first pitch on Jackie Robinson Day thought of Danny Bakewell Sr. “Danny Sr., is not only an important community leader but a living civil rights legend. Bank of America and the bank’s African American Leader­ship Team here in Los Angeles are proud to have a close business relationship with the Bakewell family and The Bakewell Company, including the Taste of Soul. We know personally the impact that Danny Sr. and his family have on Los Angeles,” said Michelle Avan, Director, Southwest Division Administrative Manager, Global Wealth Investment Manage­ment. Jackie Robinson once said, “A life is not important, except in the impact it has on other lives.” “I am honored and deeply humbled to have been asked by Bank of America and the Dodger Organ­ization to throw out the first pitch on Jackie Robinson Day at Dodger stadium. This opportunity is not just for my family, and me but I share it with all of the people within our community who have fought with me and long before me to break down the barriers of oppression and racism, just as Jackie Robinson broke down the barriers of oppression and racism within major league baseball. While the first pitch is only symbolic gesture, it is a reminder of how far we as a people have come, but also stands as a reminder of how far we still have to go,” said Danny J. Bakewell, Sr. So it is fitting that the legacies of two men who have advocated for the less fortunate will intersect in a stadium where all are normally encouraged to “think blue” but on that day we will all think about the matchless contributions of #42.